Demand Justice is putting pressure on Sens. 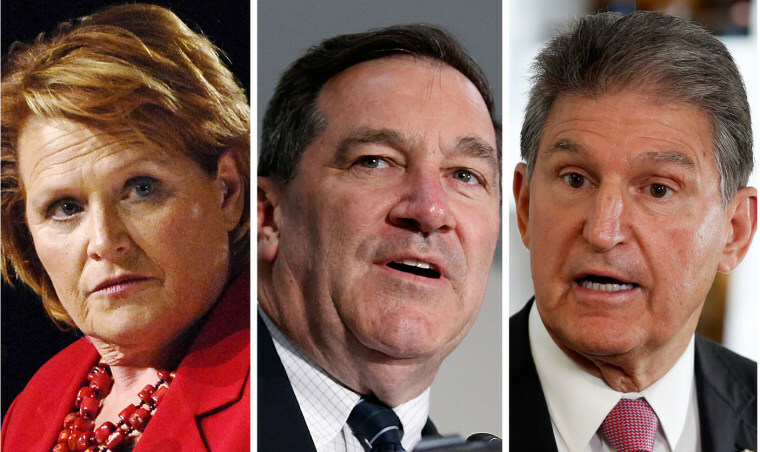 Heidi Heitkamp, D-N.D., Joe Manchin, D-W.V., and Joe Donnelly, D-Ind., in confirmation fight. WASHINGTON — A progressive group working to sink President Donald Trump's Supreme Court nominee is launching its first round of advertising Friday in three key states to pressure Democratic senators to vote against Brett Kavanaugh. The ads, obtained by NBC News, are complimentary of the Democratic senators' efforts to preserve the Affordable Care Act but caution that those actions could be nullified by the next high court justice. Those three senators are primary targets of campaigns from both sides of the aisle as the confirmation process gears up because they represent states Trump won in 2016, are up for re-election in November and voted for Trump’s first Supreme Court nominee, Neil Gorsuch. Democrats are honing in on the issue of health care as a key argument against Kavanaugh's nomination. The Supreme Court could hear a case in the next term challenging pre-existing conditions protections. And the subject is proving to be a top issue on the minds of voters heading into the midterms. With only 49 votes in the Senate, Democrats have little ability to block the nominee from moving forward. If all Democrats vote against the nominee, one Republican would have to join with the Democrats for Kavanaugh to fail. Demand Justice is already airing ads in Maine and Alaska, targeting Sens. Susan Collins, R-Maine, and Lisa Murkowski, R-Alaska, both senators who are pro-choice and voted to uphold Obamacare. Both have said they are keeping an open mind and will examine Kavanaugh’s record.